In the past, corporations and other organizations only had to worry about brand and reputation management in traditional media outlets, such as television, radio, newspapers, and online forums and blogs. 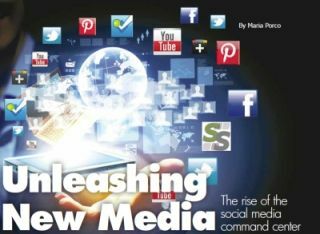 With the proliferation of social media, however, the number of new outlets has grown dramatically. Now, in addition to patrolling the print media and airwaves, it has become imperative for organizations to manage their online social presence, tracking and responding to public conversations about their brands on Facebook, Twitter, LinkedIn, YouTube, Pinterest, Tumblr and more. So how does a company monitor a multitude of social media sites and millions of conversations at once without missing vital information? Increasingly, the answer comes in the form of the social media command center. As the name suggests, a social media command center is a central place where staff from multiple departments can easily follow, analyze and react to social media conversations. However, it is far more than a bunch of computers and monitors used to avert a brand crisis. The social media command center provides a number of additional opportunities for an organization by serving as the heart of its social media strategy; driving new content creation opportunities, marketing intelligence and campaign measurement efforts; and providing responses to customer support issues. There are a number of elements involved in the creation of a social media command center. We will explore three in this article: hardware and logistics, department organization, and content management and presentation software. Decisions involving hardware—the size and number of screens, workstations and networking equipment—will be largely determined by the size and scope of the command center. For a large organization looking to manage its brand, the command center may be a large room with several workstations, where staff can immediately create content in response to a social media conversation. Smaller organizations may have fewer departments and employees involved, and may opt for a smaller cubicle or kiosk, where one staff member can keep an eye on what’s happening. The intended use will determine how many screens will be needed, how large they will be and where they will be located. An organization may want to group them into one large video wall acting as a single screen, separate them to show different content on each screen or any other possible arrangement. When launching the social media command center, it’s important to remember that social media affects several departments within an organization, including brand marketing, digital marketing, public relations, customer service, IT and more. One implementation strategy is for a single department to take prime ownership of the command center. Most likely, this will be one of the groups managing the digital aspect in a marketing department. Marketing can then invite other departments as it sets up a multidisciplinary team, so they can jointly develop the necessary processes and procedures required. For example, the marketing and support teams will need to develop a process to deal with any customer issues that arise on social media sites—which can pop up at any time and quickly escalate if not dealt with in real time. Determining an appropriate process with specific accountability and escalation channels before an issue arises will save a significant amount of time when resolving it. One of the most important aspects of the command center is the social media content itself. Various social sites can be monitored directly, or with the help of powerful social media monitoring platforms such as Sysomos, Radian6 and Lithium. These platforms will not only help monitor trends about a brand or industry, but also provide demographics on users, identify key influencers and offer sentiment trends. Some social platforms like the recently acquired Bluefin will provide specific analysis of TV ad campaigns, greatly enhancing the success of those campaigns. Presenting all of this data and information in a simplified, yet dynamic way is a key part of the social media command center. To drive this content to screens, a content management platform should be able to display live social media feeds from any number of sources—such as Facebook, Twitter, and YouTube—in an easy-to-absorb format to screens in the command center. The platform must be able to display content from sources in real time, in addition to providing analytics in a manner that simplifies understanding and prevents information overload. For example, data can be segmented by demographic, geography, type of sentiment (complaint versus compliment) and more, and then presented in charts, graphs, gauges, counters or other graphics. This information can be coupled with live TV news feeds, various RSS news feeds, financial data feeds and other external information that’s relevant. Additional internal data can also be displayed, providing even more contextual information, all at a glance. By displaying these various “channels” as a command center dashboard, all graphic indicators are contained on one screen to greatly simplify the jobs of those monitoring millions of conversations at once. A control panel allows for the changing of channels depending on the situation. For example, if a celebrity tweets that they dislike your product, you’ll want to go into an “emergency mode,” where you focus on Twitter to monitor and control the fallout. Or if you see an unusually large number of positive conversations regarding your product by Facebook users in a certain region, you can again drill down to see what happened to generate such a response. The content management system should also allow the command center staff to change the layout of what’s on screen so the most appropriate view of the information is available. For example, a standard playlist of content could play out in normal operation, but in the case of a special event, the screen content can be focused entirely on one social media site, or on TV and the social response simultaneously, or whatever format makes sense for the situation. The command center staff would essentially be controlling their command center video wall screens like a TV newsroom, bringing up the most relevant video or graphical feeds as the situation requires. With a management system that can deliver content to multiple endpoints, the same content or a subset can be sent to staff’s desktop PCs or even their tablets and smartphones, keeping them in the loop even when they can’t physically be in the social media command center. As we mentioned above, one of the more common uses for a social media command center is brand monitoring and brand reputation management. Social media has dramatically increased the sources of possible attack on a brand and has made it possible to escalate and spread the attacks very quickly. Organizations must be able to respond to an e-crisis immediately. The social media command center provides a tool to monitor and analyze the social media world, and in case of a crisis, act quickly and effectively to protect their brand. But managing an e-crisis is just the beginning. A social media command center allows an organization to keep tabs on the competition, while providing an amazing opportunity to connect with customers. Companies can encourage customers and partners to provide feedback or suggestions for improvements via social media. The benefits of doing this are clear. It allows the organization to improve customer service and support by quickly resolving customer issues, while supplying them with the critical feedback they need to stay a step ahead in enhancing and improving their products or services. It also increases customer retention, which directly affects the bottom line, as customers are generally happier if they feel a company is engaged and cares about their issues. A social command center can also be used to track the effectiveness of marketing campaigns. Graphs on the center dashboard can track how a new ad campaign is trending on Twitter, for example, while a counter can display the uptick in Facebook “likes” a company has received since introducing a new ad on the site. Another proactive use of the social media command center is to serve as a source of new content, created in response to live events being monitored. One recent example is the real-time response created by the Oreo cookie brand staff in response to the Super Bowl power outage. The “You can still dunk in the dark” tweet with a corresponding image was retweeted about 15,000 times. And Oreo went from having 2,000 Instagram followers pre-game to 36,000, with more than 16,000 pictures submitted by consumers as votes for “Cookie” or “Creme,” tying to their Super Bowl ad-spurred seven-week contest for the best part of the Oreo. This type of real-time response would not have been possible if the brand had not set up a social media command center at agency 360i’s Tribeca office. New applications for social media command centers outside the corporate world are also emerging. Recently, the American Red Cross opened a new social media command center at its Disaster Operations Center at the organization’s headquarters in Washington, D.C. In its center, the Red Cross is using social media trends to monitor and respond to victims of natural disasters. By tracking and mapping tweets and other conversations, they are able to provide real-time information to relief workers, leading them directly to affected individuals. New applications and opportunities for social media command centers will continue to develop, but they will all have one need in common: the ability to drive social media content to screens, and display it in a manner that is easy to digest and act on quickly, whether it’s saving your brand or saving lives.